[two_third]Last week we did a one day event at the Waldwick Library for their kids summer reading program. We designed a new set of puzzles for this event. These were slightly easier than normal, it was designed for kids after all, and they had only 45 minutes to solve everything instead of the normal hour. 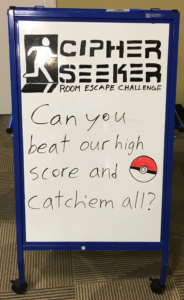 For this event they had to free a Meowth Pokémon that was locked in a cabinet. To get to it they needed to solve several other puzzles obviously. These ranging from the easy to the unusual. A simple word lock on a toolbox where they had to look out the window and across the street to find the word. A Dance Dance Revolution pad that released a lock on a drawer if they tapped out the right combination. There was even a remote control car that had to fetch a key from inside a large overturned cabinet. While that sounds easy, the cabinet was 20 feet away from the controller. This meant the person driving the car had to take directions from the group that could see where the car was going. Of course, we tossed in a few other locks and puzzles to round things out. All groups successfully beat the room and did quite well. Times ranged from 30-40 minutes out of a possible 45 minutes. This was actually our plan with the room design. We wanted the kids to be able to solve the room with no or minimal hints. We also wanted them to have to work together. This is why we had things like the remote control car that required at least two people. Our goal was for everyone to have fun and to feel good about the job they did. They all seemed to enjoy themselves and no one was disappointed outside of a few finding out they couldn’t keep Meowth. So overall, I’d say the day was a complete success! The Suburban News stopped by to take some pictures and interview the kids. You can read their article here.